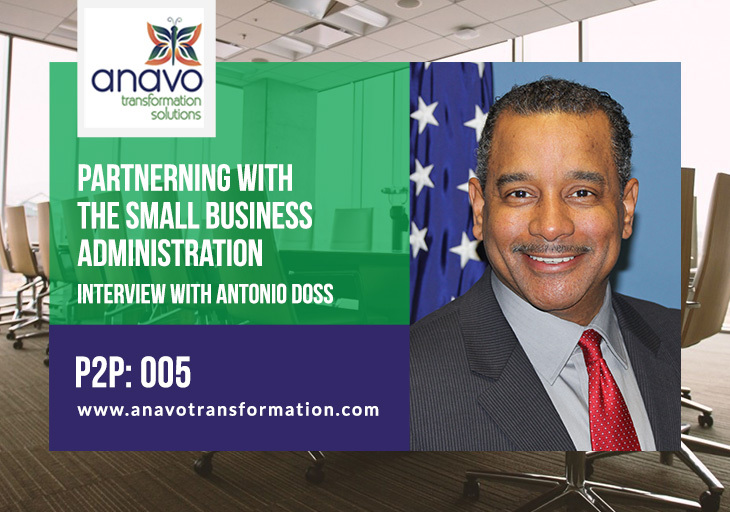 I am thrilled to have Antonio Doss, the Washington Metropolitan Area District Director for the U.S. Small Business Administration, on the podcast today! Antonio Doss was appointed District Director of the U.S. Small Business Administration’s (SBA) Washington Metropolitan Area District Office on December 29, 2013. As District Director, he oversees the delivery of SBA’s small business financing products, contracting programs, and entrepreneurial coaching services in Washington, DC, Northern Virginia and Suburban Maryland. He has supported the economic and community development needs of entrepreneurs and under-served communities throughout his career. Prior to his current assignment, he served as Associate Administrator for SBA’s Small Business Development Center program. Earlier Mr. Doss served as a Senior Vice President at Bank of America for Community Development Banking in the Mid-Atlantic region. What exactly is the SBA’s role in the growth of small businesses? What are the programs available from the SBA for individuals to start AND to grow their businesses? How do you define ‘small’ businesses? Can you explain your community outreach programs and your objectives with this program? Why do you think some businesses reach a plateau?